The Mutiny was a lucrative operation. Each of its 130 rooms and suites had its own name and elaborate thematic décor: Marakesh (sic), Singapore, Lunar Dreams, and the all black Midnight Express. In the club, “Mutiny Girls” poured Dom Perignon nonstop. Outside, valets parked Bentleys. Tipping was heavy. The members’ dress code included Rolex, beeper, cowboy boots, and a leather bag containing at least ten thousand dollars in cash and a .380 Walther PPK semiautomatic, “the sidearm of choice for the discriminating 1980s cocaine dealer.” At 2951 South Bayshore Drive in Coconut Grove, the Mutiny was about a quarter mile as the crow flies from Miami City Hall. In the Introduction to Hotel Scarface, Billy Corben and Alfred Spellman (producers of the documentary series Cocaine Cowboys) call the Mutiny “the Rick’s Café of Miami.” It certainly attracted the usual suspects: cocaine kingpins with their girlfriends and lieutenants, the bankers who laundered their money, the lawyers who tried to keep them out of jail, and even some of the cops trying to put them in. Plus the see-and-be-seen celebrities: Paul Newman, Burt Reynolds, Sally Field, Ted Kennedy, Richard Nixon, Arnold Schwarzenegger, Al Pacino while filming bits of Scarface, and Don Johnson and Philip Michael Thomas while filming Miami Vice. In Hotel Scarface, it’s hard to tell the players even with a scorecard, or in this case, the cast of characters list preceding the first chapter. They bounce in and out of the short chapters Farzad uses to piece together individuals’ stories and chaotic events. The reader needn’t try to keep track of everything—just go with the splashing flow and patterns will emerge. They try to eliminate each other. Everybody eventually gets arrested. Almost everybody cops a plea and rats out his associates. And yet they’re still pals. Rat and rat-ee embrace in a prison hallway. The first big drug trial falls apart when the star witness exchanges salutes with the defendants on his way to the stand. The Cuban drug lords had donned the mantle of the legendary Mafiosi who did business and pleasure in South Florida a half century earlier, and the book’s title refers to the Mutiny’s serving as the model for the Babylon Club in the 1982 remake of the gangster film Scarface. Most of the filming was done in LA, however, because Miami’s civic leaders disavowed the connection, lest Cuban Americans be cast in a bad light. Arrested in 1991, Willie and Sal successfully tampered with the jury of their 1996 trial but lost the rematch in 2002. Sal was defiant and painted as the brains of the outfit. He got 215 years. Willie copped a plea and got 20. Farzad is too young to have Mutinyed first hand. He became fascinated with the place as a local teenager after an encounter with an old member. Nearly 100 interviews and many kilos of other research later, he’s captured a time and place thankfully not to be seen again. Adkins begins by exposing the preceding,1885 Constitution, as “a document of the people of its time— if one counts only white men as ‘the people.’” An 1885 relic of the Reconstruction era, Florida’s constitution was ill-equipped to govern the rapidly growing and changing population of a diverse state. Among other problems, the “horse and buggy constitution” enabled some of the most extreme malapportionment in the country, resulting in a legislature that grossly overrepresented rural North Florida and gave little voice to the growing urban population of South Florida. Attempts to rewrite the constitution in the 1940s and 50s failed. Enter the US Supreme Court. Beginning in 1962 with its decision in Baker v. Carr, the Court began cracking down on malapportionment. These decisions contributed to the era’s “spirit of reform” and laid the foundation necessary for a new Florida Constitution. The Florida legislature took up constitutional reform again in 1965 by creating the Constitution Revision Commission. Over the course of 1966, this thirty-seven member body drafted a new constitution that was later debated, revised, and passed by the legislature. The people ratified the new Constitution in 1968 and it has governed Florida ever since. I recommend Making Modern Florida to fellow attorneys, political enthusiasts, civil rights devotees, and any civically-minded Floridian who has ever lamented Florida’s more novel constitutional provisions. Adkins does an admirable job explaining the issues, both substantive and legal, in plain language. She also adds humor and humanity to the narrative by including cameos of the main players and colorful anecdotes, such as the politically powerful Pork Chop Gang’s 1955 blood oath and future-governor Reuben Askew’s ill-fated attempt to conquer insomnia during the 1965 special session. Do be prepared to do some skimming. Readers will have different levels of interest in the nuts and bolts of the constitutional revision process. In addition, Adkins lists a number of details in the main text that would be better consigned to the endnotes. Nevertheless, the knowledge and insights to be gained from Making Modern Florida are well worth the effort. Peggy Macdonald has written an engaging biography of Marjorie Harris Carr (1915-1997), one of the three Florida Marjorie(y)s—including Marjorie Kinnan Rawlings and Marjory Stoneman Douglas—who used the power of the pen to bring awareness to the precarious state of natural flora and fauna, which provide a glimpse into what Florida originally looked like.To boot, it’s a fascinating history of the environment and gender politics in Florida, a detailed chronicle of an extended legal battle between environmentalists and the Army Corps of Engineers, as well as a daring and tender love story. Macdonald’s overview of Carr’s life and the obstacles to her many achievements in the introduction sets our expectations high. And we wonder, just how did Carr face institutionalized gender discrimination, transform the modern environmental movement, and raise five children in one lifetime? Macdonald effectively contextualizes Carr’s moral crusade as a devotee of flora and fauna in post World War II Florida, where progress and industry ruled the day, at the expense of the environment. Carr worked her way from local causes to state-wide activism, serving as a catalyst, Macdonald writes, in the “transition from conservation—or the idea of preserving nature for humanity—to environmentalism, whose goal was to protect nature from humanity.” Rigorous and tenacious, Carr forged her own brand of activism, using her M.S. degree in zoology from the University of Florida to publish her ongoing research on bass, moccasin, or the Oklawaha River, harnessing the clout of editorial teams on major Florida newspapers to gain support for her views. Yet when it was more effective, she was willing to play the part of a demure housewife. Some legislators, such as state senator Bob Graham, only knew her as Mrs. Carr, Archie’s wife. 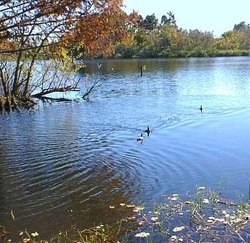 A state legislator once claimed that Carr's mere presence at the Florida State Capitol persuaded legislators to take action on the barge canal issue. "All you have to do is walk the halls," the legislator told Carr. "You don’t have to say a word. Just be seen there, and every legislator who sees you will say to himself, 'Oh, yes. The Barge Canal.'" Macdonald’s inclusion of quality photographs reproduced in grayscale partly satisfies the desire to “see” the places mentioned throughout the text. Those who want to visit and see the Florida places she saved, can, and Macdonald’s biography shows us how she did it. For me, it is especially satisfying to read about a woman who had the passion and knowledge to motivate and inform citizens of this planet who grew up without environmental consciousness as part of their curriculum in schools, the message sent through children’s films, or the reason for recycling programs in their neighborhoods. Macdonald’s biography of Carr compellingly illustrates her life-long fight. In a city like Miami, whose growth over the past century has been primarily vertical, it is easy to forget one is walking on ground that has been tread on for more than ten thousand years. In Digging Miami, Robert S. Carr, Miami-Dade County’s first archaeologist and executive director of the Archaeological and Historical Conservancy, directs his readers’ attention towards the subterranean history of Miami as told through the artifacts found during planned excavations and often accidentally during construction. The book provides the reader with a unique vision of the past easily overlooked on a stroll through the streets of the Magic City. Much of Digging Miami is a catalogue of ancient trash heaps and bone yards. For the archaeologist, it is fortunate that inhabitants of Southern Florida have been dumping their garbage for thousands of years, because refuse heaps yield the clues needed to recreate the past. While archaeological research has been conducted in South Florida since the late 1800s, the earliest excavations were not done with a great deal of care in preserving or cataloguing the artifacts found. More modern methodology only began to be employed in the early 1980s, so one can assume there is still a lot left for the ground to yield. The book is structured so that the reader progresses from the very earliest fossil records, before humans first came to South Florida, through different waves of settlement beginning with those who migrated from Siberia, then the Florida Indians, Tequesta, Seminoles, Spaniards, and into the more recent waves of immigrants who developed the region beginning in the 19th century. The ease with which a wrecking ball can ruin a potential site of excavation is shown in the 1897 destruction of a fifteen-foot high burial mound at the mouth of the Miami River. Construction crews building the Royal Palm Hotel leveled the mound, not to make room for the hotel’s foundation, but to ensure hotel guests sitting on the veranda would have an unobstructed view of Biscayne Bay. Carr includes documentation from the foreman of the clearing crew, John Sewell, who wrote that all they found were a few “trinkets.” However, Carr chillingly claims that between fifty and sixty skulls were recovered and given away and that, “Many skulls made their way to the Girtman Brothers general store, where they were reportedly sold as curios to visiting tourists.” Throughout the book, Carr gives examples of this kind of skullduggery. Carr’s work as an archaeologist requires extreme diligence to ensure that we do not lose artifacts that lie under the foundations of buildings currently being leveled to make room for more modern structures. When I began reading, I hoped to learn more about the forgotten Lemon City Cemetery in Miami that was rediscovered in 2009 after bones and coffin fragments were unearthed during demolition of a YMCA to make room for low-income housing. Local historian Larry Wiggins was able to locate the death certificates of 523 deceased people, all of whom were black, 70% of whom had come to Miami from the Bahamas or were of Bahamian descent. Of the 523 reported burials, only 20 sets of bones have been recovered. Others were either moved by family members when the cemetery was abandoned or ground into what became the foundations of the YMCA building. Reading Digging Miami, I was surprised at how thoroughly I was affected by a newfound understanding of how vulnerable the relics of the past are to modernity’s machinery. Carr explains that historical preservation is important, “because it defines us as a civilization and a community. We connect to our history because it reveals a deeper part of who we are and who we should not be.” I find myself walking more gingerly through the city these days, more mindful that under the asphalt and macadam lie the bones and belongings of people who lived here and died with no markers to indicate their presence. Jan Becker lives in Florida. Her writing has appeared in Sliver of Stone Magazine and is forthcoming in The Circus Book, Emerge, and Brevity Poetry Review. Some of the communities discussed in the book were based on religious ideals. A colony for Catholics was established in San Antonio in the 1820s, a safe haven for Jews north of Micanopy in the 1880s, and a permanent camp of Spiritualists in Volusia County in the 1890s. More secular ideas motivated other groups. The principles that drove Cyrus Teed and his followers to found the Koreshan Unity settlement in Estero in the 1890s combined religion with philosophy and science, while the Chautauquans retreat at Defuniak Springs became an “intellectual center” during the early 1900s. Yet other colonists were motivated by the hope of survival. Eleven hundred indentured servants, mainly farmers from Minorca on the verge of starvation after a three-year drought, came to settle the New Smyrna colony on Mosquito Inlet. Likewise, economic hardship brought people to Withlacoochee, Escambia Farms, and Cherry Lake Farms, three cooperative communities planned by the federal government as part of the New Deal. The book presents each community in a separate chapter that begins by placing the group in its historical context and ends with a description of the colony’s ultimate fate. Some of the communities evolved into other entities. The Catholic colony in San Antonio, for instance, became a Benedictine abbey, while Melbourne Village, Crystal Springs, and Defuniak Springs are “viable towns” today. Other settlements failed dramatically. Moses Levy’s Pilgrimage Plantation never attracted enough settlers to begin with, and the continuation of New Smyrna became impractical after one group of its colonists mutinied and a second fled to St. Augustine to escape the harsh treatment of their overseers. The Yamato Colony, a community of Japanese immigrants near Boca Raton, “disappeared entirely” when the federal government used its powers of eminent domain to appropriate the Yamato lands in 1942, even though the colony’s inhabitants were so well-respected by their neighbors that not a single citizen of Yamato was interned during World War II. Utopian Communities of Florida also delves into the backgrounds of the idealistic, and frequently charismatic, individuals who founded the communities. The authors actually devote more space to Cyrus Teed and the development of his ideas than on the Koreshan Unity Teed established at Estero. The book describes the life and philosophy of James Cash Penney, “a man of action with a growing ambition that grew more aggressive as he accumulated more wealth.” After building the J.C. Penney Company department stores to great success in the 1920s, Penney established the experimental Penney Farms near Green Cove Springs, “to try out his ideas of scientific management of farms and a cooperative arrangement for profit sharing.” He was forced to abandon the Penney Farms project when he suffered “huge losses” in the Great Depression. Wynne and Knetsch pack a lot of information into a short book and their style can be quite dry, as they focus on educating their readers, rather than entertaining them. Black and white photographs of the communities, their founders, their members, and, in the case of New Smyrna, their ruins, do help bring the history to life. Those with a particular interest in idealistic communities or the history of settlement in Florida will find Utopian Communities of Florida a compact work of scholarship with some interesting information. Today, we often think of cults in terms of their isolation from regular society: odd beliefs, odder practices, and policies like disconnection from friends and family members. At first glance, the Koreshans, the late 19th and early 20th century religious movement featured in The Allure of Immortality, seem to follow the same trend: an eccentric leader, Dr. Cyrus Teed (who names himself Koresh after a religious vision), who claims to be a Messiah and predicts the end of the world; a following which lives in collective housing, hiding itself from reporters; and repeated moves, from upstate New York and San Francisco to Chicago and eventually to swampy Estero, Florida. But rather than being an isolated cult, the Koreshans were tied in with politics and society, first in Chicago, where they intersected with the suffragette and labor movements, and later in Estero, where they became intimately bound up in the nascent politics of Lee County. They also advertised heavily and ran a successful printing business for decades. Much of what the public knew about the Koreshans focused on their quirky religious beliefs. Lyn Millner doesn't linger on or sensationalize these, focusing instead on how they affected the movement's workings and external relations. Equality of the sexes drew women to the movement—women outnumbered men from the moment Teed set up shop in Chicago in 1886—and prompted rumors, lawsuits and threats from their spurned husbands. The related goal of "breaking the family tie," showing no particular regard for parents, siblings, or children, shaped hierarchy and organization within the Unity, the Koreshans' organizing body. The goal of strict celibacy was shared with similar communities like the Shakers, and helped Teed forge alliances with them, as did their practice of collective living and staunch opposition to Gilded Age capitalism. The Koreshans' most particular and famous belief is the hollow Earth theory. Millner explains it thus: "Imagine peeling the paper map off an old-fashioned school globe, slicing the globe open, then pasting the map inside. . . At the center of the globe is the entire cosmos." China, Teed said, was separated from America not by the Earth, but by the heavens. Rather than focusing on the scientific particulars, Millner discusses the hollow Earth theory in the context of a long and expensive Gulf beach encampment that Teed and followers conducted in an attempt to prove themselves right. The Koreshans' theories and practices drew ridicule from the press, a powerful force in the late nineteenth century. The press is, in fact, one of the main characters in the book. Teed's relationship with journalists, who would frequently publish inaccurate and sensationalist stories, was always tense and sometimes downright hostile. When confronted by a reporter, one Koreshan said, "You newspapers may sneer all you like, but the time's coming when you will tremble. The end of the world is at hand. Other folks fear it. We know when it will be here." Where other movements crumbled under the harsh light of yellow journalism, the Koreshans were steadfast, even after repeated scandals, migration across the country, and even Teed's death, when their expectation of his resurrection failed grotesquely. Millner writes that she found it difficult at first to get inside the mind of Cyrus Teed, in part because his writings, convoluted and esoteric even in personal letters, contrast sharply with descriptions of him as a quiet but charismatic and hypnotic man. How could a doctor from New York convince hundreds of believers to follow him to the most remote corner of Florida, to set up a city with nothing but their bare hands? But over the course of the story, Millner captures Teed's power and the committed faith of his followers becomes clear. For a book of historical nonfiction, The Allure of Immortality contains numerous downright thrilling moments. A low-speed foot chase, in which a constable and an attorney, seeking to arrest Teed and co-leader Victoria Gratia, chase after them across Chicago and onto a train, had my heart pounding. And a brawl over a misheard phone call in the sandy streets of Fort Myers between then-sixty-seven-year-old Teed, a hotelier, the town marshall, and several others acts as a turning point in both the prophet's life and the politics of Lee County. there were so many fish in the shallows that the bottoms of their skiffs rumbled with them. . . Disturbing the water produced clouds of flickering blue-green plankton, an effect one follower compared to the Milky Way. Sometimes they entered the water and bathed in the phosphorescence, carrying it out on their skin. The Allure of Immortality interweaves the stories of Teed, his followers, the press, turn of the century society, and the harsh and beautiful landscape of southwest Florida. I couldn't recommend it more highly—as high as the heavens above, or even beyond them to China. James Barrett-Morison, a Florida Book Review Contributing Editor, is a native Miamian now living in Boston, Massachusetts. "Every kid growing up in Florida learns that the Spanish explorer Ponce de Leon led the first bunch of Europeans to land on the peninsula, on April 2, 1513. And for decades, they were also taught that Ponce was on a special quest . . . a magic fountain that restored youth." Whether you are a Florida native or have only visited, you have probably heard of Ponce's quest, and may have even dipped your toes into some Floridian water at least once or twice. Although the Sunshine State's springs hold no magical properties, "the story of the mythical, magical waters is in so many ways the story of Florida." Rick Kilby, a graphic designer in Orlando, Florida, stumbled upon his own quest for the Fountain of Youth during a family gathering in St. Augustine, which is reputed to be Ponce de Leon's landing site. While exploring a spring's tourist attractions, Kilby found it to be "both kitschy and historic, and I loved it." Soon after he began traveling up and down the state, hitting every tourist spot that even remotely connected itself to the great Spanish explorer and his legendary spring. 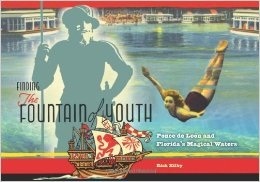 Finding the Fountain of Youth is a compilation of Kilby's findings, from historical facts about the state's development to vintage brochures, postcards, and archival photographs of the various "tourist traps." This colorful book begins with a brief history of Ponce de Leon's exploits: how he mistook Florida for another island, began his search for gold, and attempted to establish colonies among the indigenous Native American settlements. Kilby debunks a few myths, and then describes how local advertisements appropriated the Spaniard's quest for the Fountain of Youth to boost the tourist trade. After the Civil War, and again in WWII, waves of veterans and the elderly settled roots into the swamps of the state, making their way inward from the coast. Even Harriett Beecher Stowe, in a chapter of her 1872 book Palmetto Leaves entitled "Florida for Invalids," said, "If persons suffer constitutionally from cold; if they are bright and well only in hot weather; if the winter chills and benumbs them, till, in the spring, they are in the condition of a frost-bitten hot-house plant—alive, to be sure, but with every leaf gone—then these persons may be quite sure they will be better for a winter in Florida, and better still if they can take up their abode there." Thus, the myth was perpetuated that Florida's springs held magical anti-aging properties. Not only were the sick and aged drawn south, but also the wealthy and successful, including railroad tycoons Henry Plant and Henry Flagler. Their railroads settled parts of Florida previously untouched. Over 700 springs were discovered, "the largest concentration of springs on the planet," according to journalist Cynthia Barnett. Floridian architecture blended "Moorish, Spanish Colonial, Mission, and Italianate" to create a so-called " fantasy Mediterranean Revival" that can still be seen today: "Cream stucco. Scarlet hibiscus. Black iron grilles. High above, the whispering fronds of a coconut palm. A great red jar in the corner. A table set for luncheon on the cool, tiled floor. A brilliant splotch of sun on the wall. Your Spanish garden? Why not?..." Kilby uncovers for us a Florida that goes beyond its beaches and palm trees. Packed with mermaids, ancient springs, strange stone crosses, springs, and lions, Finding the Fountain of Youth is perfect for anyone who has not explored the "tourist traps" and is interested in both the history and mythic attractions of the Sunshine State. Every page is filled with fun facts, vintage flavor, and colorful photographs of the state boasting "perpetual rejuvenation." Whether or not you call Florida your home, you will find something magical about the waters rippling through these pages.